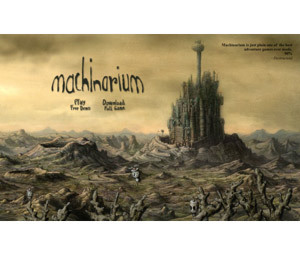 Machinarium is a point-and-click adventure game which made a very good impression with its particular style based on a non-dialog gameplay. Instead, Machinarium is based in a thought-bubbles gameplay in order to help you solve the various puzzles. Your main character, a robot named Joseph, is found in a scrap heap trying to assemble himself while its parts are scattered over the scrap heap. After that your journey begins in the nearby city where you must overcome the obstacles of the Black Cap Brotherhood (a group trying to blow up the main city’s tower). You will have to face imprisonment and a series of great challenges in order to make it and save the city. The game has won the Excellence in Visual Art award at the 12th Annual Independent Games Festival and the Best Soundtrack award from PC Gamer in 2009. The game was developed by Amanita Design an independent Czech video game developing company, founded in 2003 by Jakub Dvorský. LIMBO – An Adventure Masterpiece!